When I chose “Call of a Coward: The God of Moses and the Middle-Class Housewife” by Marcia Moston, I chose it for the title. I love books that connect our every day lives to the greater Story that God is writing. 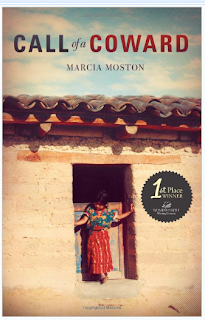 I enjoyed the transparency and vulnerability that Moston offers in her autobiographical story. Her husband answers God’s call to leave a cushy suburban life and serve as a missionary administrator of an orphanage in Guatemala. The adventure to Guatemala is a page-turner, and it was interesting to read about the people they meet. Her insights about God’s personal leading in their lives were practical and authentic. If you enjoy a good missionary story, or just reading about other places in the world, this was a good read. However, the end of the book was less satisfying. It felt as though the author was struggling to “wrap up” the story and make sense of why they left Guatemala to lead a rural church in the U.S. I felt that the author was more interested in the Guatemalan story—it took tens of pages to tell of one adventurous day in Mexico on the way to Guatemala, and it took half a page to describe ten years when they returned. Altogether, it was an enjoyable read, and I would recommend the book to those who enjoy the missionary story genre.